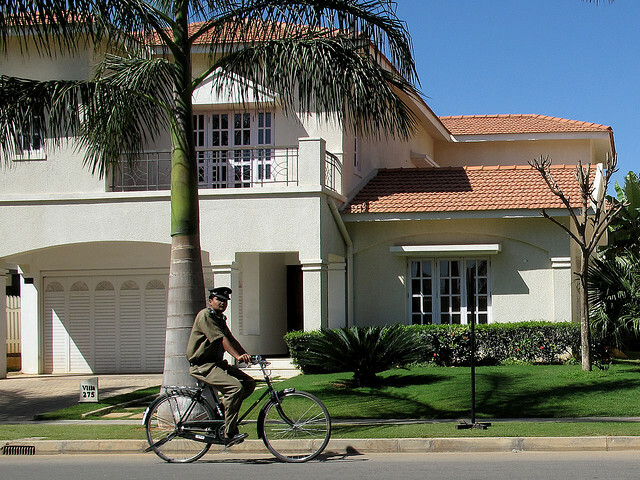 Gated communities are on the rise on Bangalore’s periphery. As demand for housing increases and incomes rise across Indian cities, private developers play an important role in promoting sustainable development by ensuring access to alternative modes of transport. Photo by Ed Yourdon/Flickr. Rapid urbanization in countries such as India is raising people’s incomes, creating huge demand for housing, and increasing vehicle ownership rates in the upper-middle and middle classes. By 2030, 50% of India’s population is expected to live in cities, and this will in turn create a huge demand for housing. To cater to the housing demand, private real estate developers in several large Indian cities are building large gated residential communities. These are primarily located in peripheral areas of the city where land is cheaper, but supporting public infrastructure is often severely limited. There is strong evidence that the interaction of transport patterns and urban form can be cyclical, such that more car-oriented urban development in locations farther from the city fosters increased vehicle ownership. This in turn requires more land to accommodate the increased infrastructure requirements for private vehicles. To address this need, developers construct more residential communities in peripheral locations. The design of the new developments, therefore, risks creating and perpetuating residential communities’ dependence on private vehicles. 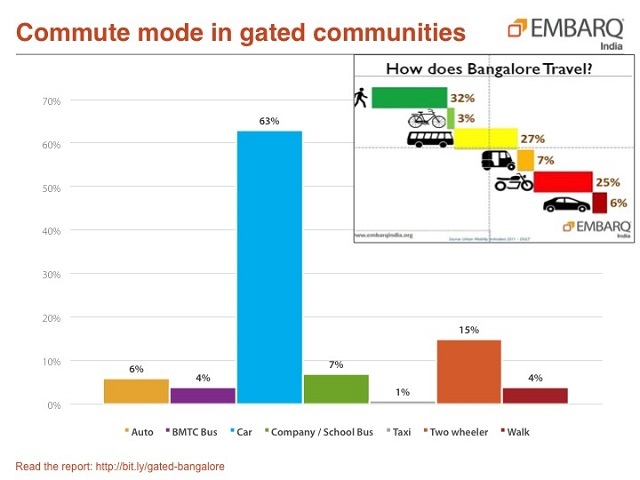 Household surveys conducted by EMBARQ India in these developments in Bangalore show that in comparison to the rest of the city – where 6% of people drive cars – roughly 63% of those living in these gated communities drive. Peripheral residential development increases demand for private vehicles in Bangalore. Graphic by EMBARQ India. Transport thus has a strong spatial structuring effect on cities. This is evident by the over five-fold increase (466%) in the built up area of Bangalore from 1973 to 2007, with growth primarily occurring at the city’s periphery. A session at EMBARQ India’s CONNECTKaro conference earlier this year focused on the role of private developers in building a sustainable built environment. The session also created awareness for the need to develop indicators and benchmarks to measure how the built form impacts travel patterns in Indian cities. These indicators and benchmarks will encourage private developers to incorporate design practices that promote sustainable transport patterns and create neighborhoods and communities that are energy-efficient, inclusive, safe, walkable, lively, healthy, and climate resilient. 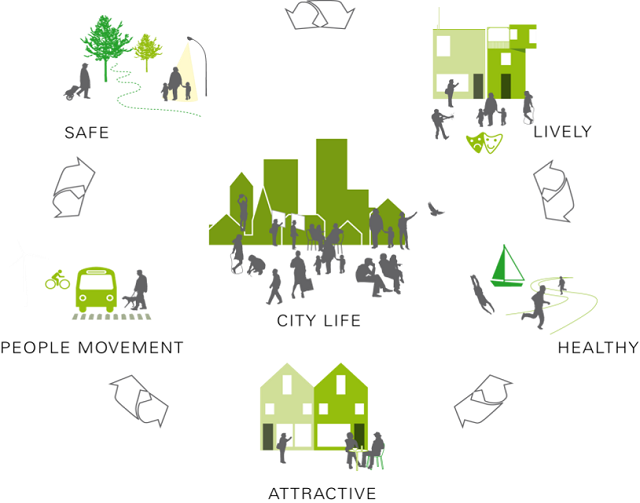 EMBARQ’s vision for the 2030 City. Graphic by GEHL architects. The authors of this blog were part of the discussion panel at the conference, with Ashwin Mahesh representing the Residents Welfare Association (RWA) at L&T South City, a gated community in South Bangalore, as well as multiple citizen action and civil society groups in Bangalore, and Anjali Mahendra representing EMBARQ India. Along with the authors, other panelists at the session included an architect from eminent architecture firm Prem Chandavarkar, Rangesh A.V. of the Bangalore development Authority (BDA), and Chandrashekar Hariharan, a leader in the Indian Green Building Council (IGBC) and a private developer of sustainable residential communities himself. The session was designed to gather perspectives from multiple key stakeholders on these issues. 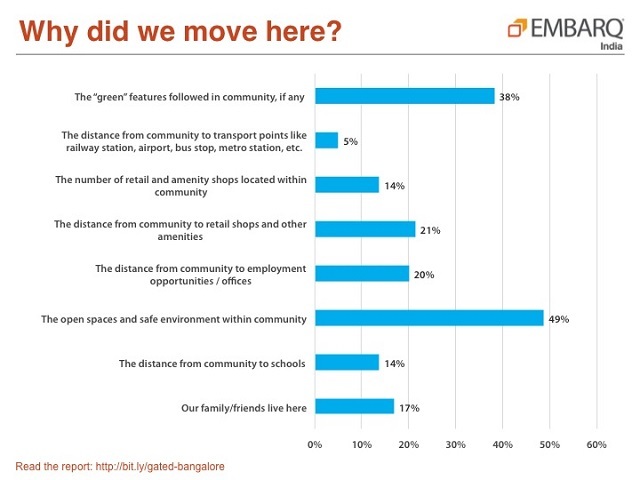 A household survey of residential communities conducted by EMBARQ from November 2013 to April 2014 showed that about 49% of respondents chose to buy or rent a home based on the open space and safe environment within that community. Almost 38% selected their home based on the community’s commitment to green practices and environmental issues. Presence of safe physical infrastructure was considered by the majority of respondents as the most important factor that would promote walking and cycling. A residential community with access to safe, open spaces and a commitment to green practices is a priority of many Bangalore residents. Graphic by EMBARQ India. Developers should focus on mixed use development and urban design aimed at ensuring better connectivity and access for residents. This includes landscape design, which is typically viewed as a visual discipline, not a spatial one; however, done properly, it can help create continuity of space and develop a sense of community. Developers must consider their investment as a means to improve the neighborhood and the civic realm and this can translate to increased market demand. Small projects constitute the majority of sites being developed in the city today. Policy makers should address the wide diversity in demand across dwelling sizes, types and affordability. The Bangalore Development Authority (BDA) should consider a town planning scheme to promote integrated and inclusive living. Policy makers and development authorities such as Bangalore Metropolitan Region Development Authority (BMRDA) and BDA should adopt and enforce initial plan approval conditions based on how well a proposed development would perform against quality of life indicators. Having such conditions will incentivize more developers to focus on sustainable developments and can aid in scaling up such efforts. Many differences exist between the government and the real estate industry as typically builders are more concerned about maximizing gains rather than improving quality of life for citizens. Also, platforms like IGBC are voluntary and there is no mandate for developers to follow green practices. With appropriate mandates and incentives from local development authorities, private developers can lead sustainable building efforts in Indian cities. For instance, developers are usually asked to fit in more parking than what is required by the statutory parking regulations. If alternate mobility options are present, developers should have the flexibility to cater to only the required amount of parking. The role of customers is important – if they demand “green and connected communities,” developers will provide it. This market demand can be translated into a checklist of quality of life indicators, which can then be mandated by authorities like the BDA. Residents’ associations can help with retrofitting measures in existing communities and while there could be some initial resistance, experience shows that such efforts eventually lead to a sense of pride and ownership among residents. These individual communities then become evangelists for responsible and sustainable practices, sharing lessons with other similar communities, and helping to scale up such efforts.